Nettritue.com is a browser hijacker because it can modify the installed browsers illegally. Whether you run IE, Chrome or Firefox browsers, the clandestine hijacker will modify the settings of your home page and the default search provider. If the hijacker has been infiltrated already, you need to find an effective and quick removal option. If you are not sure how to remove Nettritue.com from the PC, you are welcome to read the report reviewing the latest findings on the threat. It has been revealed that Nettritue.com is very similar to PortalSepeti.com. Both of these applications are associated to Navigation network co., limited. However, the latter search provider is not identified as malicious, and in most cases it is offered as an optional search tool when installing software from kindir.net. The removal of this search provider is very simple. Needless to say, it may be much more difficult to delete Nettritue.com, especially if it has hijacked your browsers bundled with other malware. Once installed, Nettritue.com can connect to the web, install tracking cookies, record information about you and your virtual activity, and assist third parties. These parties may collect statistical information necessary for the effectiveness of online advertising, or they could activate adware attacks. Third parties are unpredictable, and they can initiate various disturbing processes. To disable the activity of these parties, you need to delete Nettritue.com and other existing threats. Unfortunately, additional threats may exist on your PC. 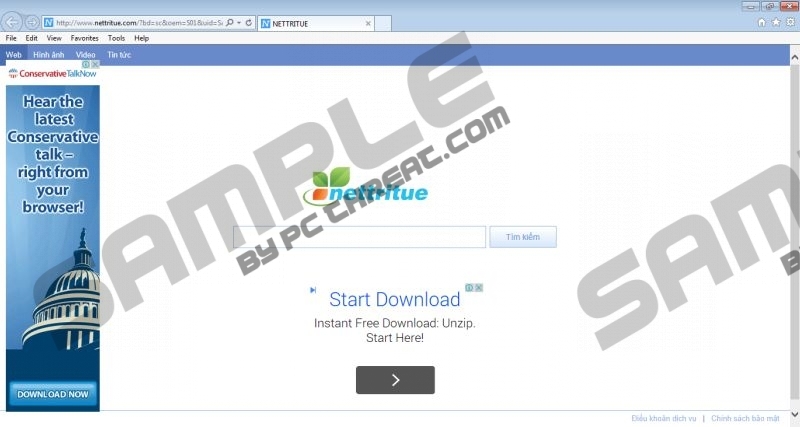 Nettritue.com is usually distributed bundled with other software after clicking on suspicious offers, such as ‘get free compressing software’, ‘get free software’, etc. Even though these installers may present the promoted software, they could also carry the silent installers of browser hijackers, adware, keyloggers, Trojans, and other threats. The removal of these threats is absolutely necessary! Of course, right now you need to worry about getting Nettritue.com removed. The successful Nettritue.com removal depends on how experienced and skilled you are. If you are not informed about the manual removal, and you have never deleted hijackers on your own, we certainly recommend trusting automatic malware removal software. Follow the instructions presented below to delete the undesirable search applications, and immediately activate authentic security software to eliminate all threats. Keep the software active for full-time protection. N.B. If you have chosen to delete existing malware manually, we strongly advise using a legitimate malware scanner by SpyHunter. This free tool will examine your operating system and will let you know which threats require removal. Move to On Startup, mark the option Open a specific page or set of pages and click Set pages. Find the URL of the undesirable search provider, change/delete it and click OK.
Navigate to Appearance, select the option Show Home button and click Change. Now overwrite/delete the undesirable search provider and click OK. Finally go to Search and click the Manage search engine button on the right. Scroll over the URL of a preferred search provider and click Make default. Now click X on the search provider you wish to delete and click Done. Open IE, simultaneously tap Alt+T (Tools menu) and select Manage Add-ons. Select a new default search provider, Remove the undesirable option, and click Close. Click the General tab, change/delete the Home Page URL and click OK.
Open Firefox and click the search provider icon on the Firefox search box. In the drop-down menu select Manage Search Engines. Click the same search provider icon and select a preferred search tool. Quick & tested solution for Nettritue.com removal.